Is this HTC One Mini leak the real deal? HTC One Mini ... or is it? We've heard much about the miniaturized version of the HTC One, inventively referred to as the HTC One Mini. A report from yesterday laid out much about the still-unconfirmed device, but today Engadget claims a "trusted" source has given it an image of the HTC One Mini along with specs of the supposedly soon to be announced phone. The image is blurry at best and could certainly be a fake, but so far this is all we have, and for now, we'll take it. 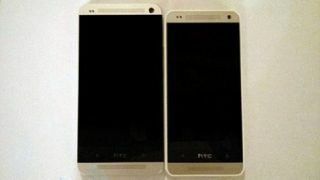 If it's the real deal, the slimmed down 4.3-inch screen version of the popular HTC One could become the next big hit. The handset bears the similar metallic body of the HTC One and reportedly has Beats Audio branded on the back. The Mini is running a "Sensed-up version of Android 4.2.2 Jelly Bean" with Blinkfeed built and boasts a 1.4GHz dual-core, which may just be Snapdragon 400 from Qualcomm - similar to the less popular HTC First. No word on when the UltraPixel camera was leaked, but the source claims the rear camera can shoot full HD video with Zoe share capture. Of course, until the actual HTC One Mini is announced this all could very well be some very nifty craft work. Even if true, these specs might change before the phone ever gets announced. Will the HTC One be coming to Verizon?